Sounds like the perfect challenge for you. Have fun! No,but I think I'll join in too. I may do only six tho. There are a lot of classics on my list that I never get too. I'll join you for Rachel Ray? And Delta Wedding, if they stay on your list? Audrey - Yay! I'll look forward to seeing your list... and would, of course, love to read Delta Wedding and Rachel Ray with you. Don't know if I'll actually finish all twelve categories, but will have fun trying. I've only read One Flew Over... and The Grapes of Wrath. Rita - I think I read One Flew Over the Cuckoo's Nest in high school, but am not quite sure. Definitely read The Grapes of Wrath way back then and have been meaning to reread it for years. I love Wharton's writing but I hadn't heard of that title so thanks for the introduction! You can't go wrong with Gaskell and Trollope. I have the Grapes of Wrath tentatively scheduled for 2019 too. Happy reading! Cleo - Trollope is a favorite! I read the Barsetshire Chronicles a couple of years ago and am just finishing up the Pallisers now. Can't wait to explore his standalone novels in 2019. I don't think I'll join the challenge but I hope to read a few classics in 2019. Your list looks full of good ones. 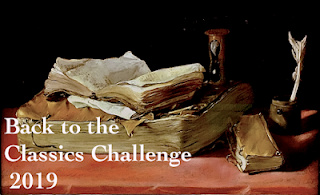 Vicki - I'm hoping this challenge will get me reading more classics again... I only read a handful this year. Reflecting back on my reading year, my thoughts have been very, very similar to yours, which is why I, too, have signed on to do the same Back to the Classics Challenge. Before Karen made her final decision to go ahead, I'd already vowed to read the classics patiently waiting off stage for me. I'm so glad you'll be doing it as well! And yes, good luck for you and for me, too! And best wishes for your Christmas. Do tell what you have planned. At least we've had a dry spell for a while, with little snow. However, I haven't had a minute to sign up which classics are which. But I hope to do so soon. And I will post an entry about it. Oh, P.S. : I loved, loved The Grapes of Wrath. It is the penultimate American classic, I think, sitting close to To Kill a Mockingbird. Somehow or other, based on your past reading, I think you're going to really get into the experience. I find that challenges help me read more of those books that might fall by the wayside for me. In 2018, I wanted to read more nonfiction, so I did a Nonfiction Challenge, and it really helped. Good luck! My reading totals dropped off too in 2018 so I could use more structure in 2019 as well. Nice list of Classics you've selected. Some of these are novels off the beaten path so to speak -- they are lesser known ones which is good. Ken Kesey and Steinbeck ... excellent. Susan - Some of my reading problems this year are the result of spending too much time on current affairs, and also adjusting to retirement. Hope this challenge helps me get back on track! I love the term of “free range reading”. I think that it is a fine thing to do. I have been decideding which Trollope books thaf I still want to read. Rachel Ray was never a book that I thought about before but I will now take a look at it. Brian - I'd like to read quite a few more Trollope novels, as well as the bio that's been on my shelf for the past few years. So many of my favorites on your list! I love Trollope and Rachel Ray was on of my favorites. I also love Wives and Daughters and have read it several times. Cold Comfort Farm is also delightful. Thank you for signing up for the challenge! Karen K. - I remember reading on your blog that you loved Rachel Ray. Now that I've finished both the Barsetshire Chronicles and the Palliser series, I'm going to start on his standalone novels! What a lovely list. I'll be joining you with Cold Comfort Farm for the comedy. Wives and Daughters was on my list last year, and my favourite read of the year. Looking forward to seeing how we all go for another year. Paula - I'm so happy to hear you loved Wives and Daughters! Hopefully I'll be reading it early in 2019. Cold Comfort Farm has been on my list for years. This is my first year participating in the challenge... can't wait to begin! I haven't read any of the books you listed but I've been wanting to read Wives & Daughters after seeing the film some time ago - I usually always read the book first so I'll have to remedy that. I'm surprised that Trollope is so neglected compared to Dickens. I only started reading him more recently & he's one of my new favourite authors. Carol - Trollope is one of my favorites, too! After reading The Barsetshire Chronicles a couple of years ago, I just finished the last book in the Palliser series a few days ago. Looking forward to exploring his stand-alone novels next. My classics reading this year was dismal... Which means I should probably try this challenge again. Hopefully better luck next time right? :) Hope you have a great time discovering some classics. Iliana - Other than Trollope, I didn't read much in the way of classics this year. Fingers crossed this does the trick. Hope you decide to join in! Yes, I find a little structure makes for a more satisfying reading life. This is my hands-down favorite challenge, and the only one I really do anymore, apart from the Goodreads books read goal. You have a marvelous line up—I need to reread Grapes of Wrath myself, but I’m thinking this might be the year of War and Peace, so I don’t want to many chunksters in the line up. Cold Comfort Farm is such a hoot—makes me actually want to reread DH Lawrence, which is sort of ironic. Enjoy the challenge! JaneGS - I know you've been doing this challenge for years and I always enjoy seeing the books you select for each category. Not sure when I'll get to War and Peace, but the time is approaching... maybe your experience will encourage me. Happy New Year! I've only read Cuckoo's Nest and Grapes of Wrath...both very good. And I've read a few of these authors. Nice choices. Joseph - I read The Grapes of Wrath in high school ages ago (and probably Cuckoo's Nest, too, but not totally sure) and have been wanting to revisit them for years.